CPLP’s well-resourced training room is based at the prestigious Park Lane International School’s Prague 1 campus which is situated in the heart of Malá Strana, a historic central district boasting attractive architecture and sculpted gardens. 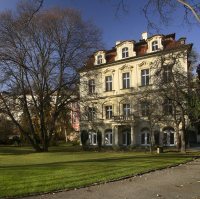 The school is housed in a beautifully appointed former embassy building which sits within 3000 m² of walled gardens and terraces directly adjacent to the walls of Prague Castle. Close to the River Vltava but away from the bustling commercial centre, the Centre for Professional Learning enjoys all the benefits of central Prague without being too central. However, several famous sights such as Charles Bridge are only a short walk from the schoolgrounds. Numerous cafes and book shops may be found in the quaint streets and arcades nearby. In terms of public transport, the CPLP is extremely well served as the Malostranská tram stop and Metro station are a two minute stroll from the school gates.